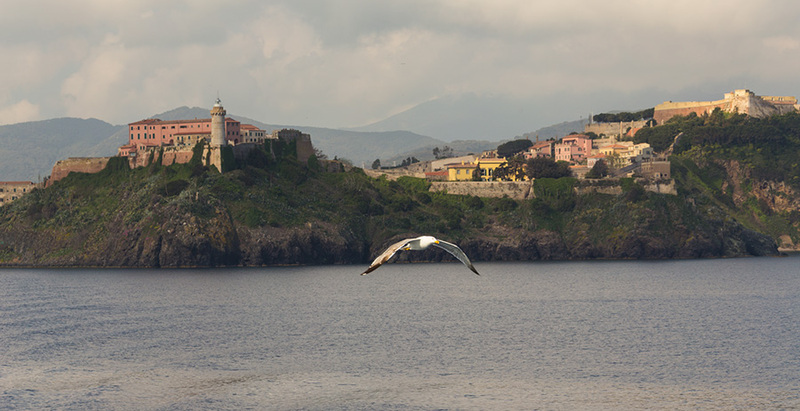 On Elba Island, there are many towns some of which are very old, but there is only one city: Portoferraio. This isn’t because Portoferraio is the main port of the island and the capital, not even for the fact that more than a third of the population live there and not even for other reasonable and plausible reasons, Portoferraio is the only city on the island of Elba because it was designed and built by the powerful order of a prestigious Florentine Renaissance prince. It wasn’t that Portoferraio was a desolate no man’s land before the sixteenth century, in fact, during the construction of the city, the administrators were sending dispatches to Florence, to advise the Prince that during the excavations some ancient remains of a Roman settlement had been discovered in it’s entirety which dated back to 2,000 years before. This included two patrician villas and a port. But you can be sure that in Tuscany, where the Romans settled before the Etruscans, they were very active in the mines of hematite (iron oxide) and in the forests of the island for their thriving steel industry. 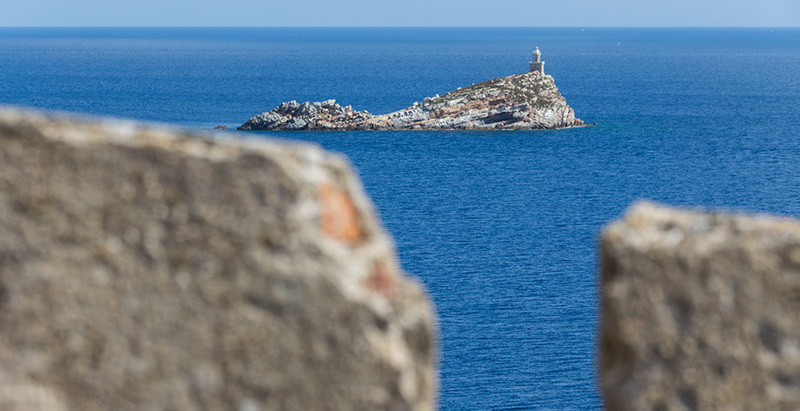 If we were to penetrate the myth, we could quote Greek sources, from which it appears that the current Portoferraio was identified as Porto Argoo of the Argonauts, but in this post I won’t go on. Let’s go back to modern times, we are in the early decades of the 1500s and the Italian coast was being tormented by constant pirate raids, let alone what happened on small islands, where it was impossible to escape “the black man”, as these pirates came mainly from Northern Africa. At that time Tunis had become the most important slave market in the Mediterranean. In front of the port of Livorno is a bronze statue much loved by the people of that town, it is the same Prince depicted in monumental style who was the founder of Portoferraio, while holding four prisoners in chains. These are the four young North African marauders defeated and enslaved by a farsighted ruler. They say that that piracy was born when man put the first tree trunk in the sea, so much so that in ancient times “trade” was combined frequently with “looting”. Nevertheless, there were times when the situation became heavier than usual: 89 years before Christ the General Pompey “cleaned” the Mediterranean with such determination that, with a strictly imperial point of view, coined the term “mare nostrum” for the first time. Fifteen hundred years later, the geopolitics had changed several times, but life on the islands remained equally unsafe. During the first half of the sixteenth century, entire villages were looted and burned to the ground. The few raids by dangerous armed robbers who counted more on surprise than anything else, were replaced by a sordid war against the imperial sea territories. The problem arose from the fact that in this troubled period of European history, two sovereigns seriously confronted each other and the consequences were felt also on the Pacific island populations. In the year 1516 Charles V, King of Spain, and shortly thereafter the German Emperor and King Francis I of France all acceded to their respective thrones together, all fierce enemies. Francis I of France didn’t hesitate to ally himself with the Turkish empire of Suleiman the Magnificent, by whose orders the powerful Ariadeno Barbarossa plowed the sea, this was the admiral of the largest naval fleet of war in those days and that from that moment on things began to rage against the Italian coast in a very anti imperial manner..
Cosimo I glimpsed the ambition and cunning of the Machiavellian prince. He came from a dynasty of bankers and besides being a subject of the emperor, was also a sponsor of Charles V, who asked to fortify Elba because, as he said, in the condition it was in, the population of the island could not defend itself from constant attacks of Ottoman piracy. It would not have been a problem for Charles V if Elba hadn’t already belonged to another principality of Tuscany the small and penniless one of Appiani of Piombino. Incidentally and quoting Honoré de Balzac, for whom “Behind every great economic fortune lies a crime”, we will say that this principality began 1392 with a palace coup in Pisa. So Charles V did not intend to annoy the Florentine bankers (the florin was for several centuries the strong currency of Europe), nor could he ignore the “legitimate” rights of the Appianei. So to content everyone, the Emperor upheld the expansionist ambitions of the Florentine, and then, pressed by an influential prelate who had taken over the cause of the Appiani, he backed down. 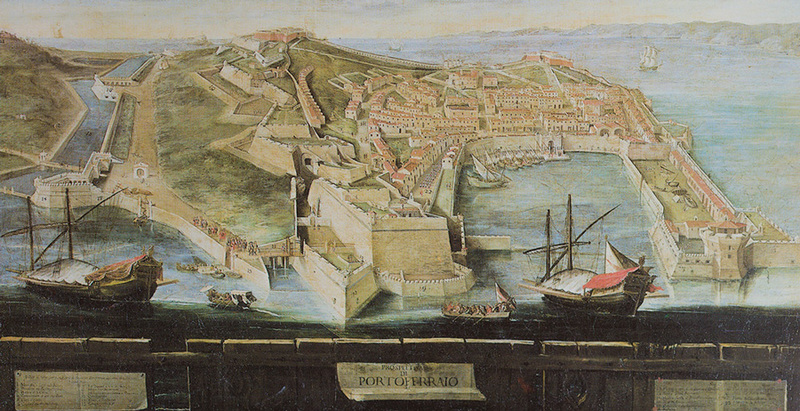 The result was that Cosimo I had to be content with the fortified town of Portoferraio, he strengthened and armed it along with the surrounding areas that came within the current municipal boundaries of Portoferraio. The rest of the island however, belonged to the Appiani, including the mines of Rio. For the Medici this was a good result as it extended their influence on the sea from Livorno and extended to Portoferraio. Cosimo I managed to use the founding of the outpost Elba as an event that increased his political authority as an enlightened prince. The Medieval Ferraia would be re-founded in the name of his new master and will be called Cosmopolis, a golden name he wanted to use to imply his vocation as keeper of the new city. We know that behind these fortifications lied a powerful pragmatic project, but today we can rightly say that what Cosimo I had thought in terms of political hegemony over Tuscany, materialized in an extraordinary city founded on nothing, where famous people worked and prospered and became a truly cosmopolitan community. But of this, if you like it, I will speak more in the next post.